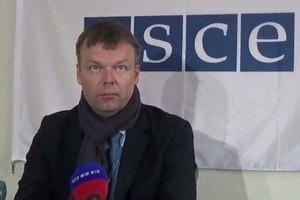 OSCE monitoring mission patrol came under small arms fire in Donbass, First Deputy Head of the OSCE Mission, Alexander Hug, said via Twitter. He did not specify which side opened fire but said that no one was hurt. "Yesterday (26 May) we recorded a threefold increase in the number of opening fire compared to the previous day," Hug said, referring to the area around Avdiyivka and Donetsk airport. Hug said some individuals want to hide events take place there from the public by blocking surveillance cameras. In the 25-km zone still there are weapons that according to the agreement should have been withdrawn. He described the conflict in Donbas as "low intensity conflict", noting, however, that casualty reports come almost on a daily basis. On May 27, the Russian occupation troops shot down a drone of the OSCE Special Monitoring Mission in the south-western outskirts of the occupied Horlivka. The drone was carrying out the surveillance for the sake of the verification of silence regime along the contact line. Later in the day, "DPR" militants disconnected surveillance cameras of the mission in the region of Donetsk.